During Science Agora 2014, we created a future town, here in Odaiba. Odaiba is famous for shopping and entertainment, but there is much more. Our museum, Miraikan, is not the only one located there, but there is also the National Institute of Advanced Industrial Science and Technologies (AIST) and the Tokyo International Exchange Center (TIEC). The community of Miraikan, AIST and TIEC is the Tokyo Academic Park and presented the workshop. The objective was to create a futuristic Odaiba in the year 2020, as I mentioned above. We posed a question below to participants. Odaiba will be one of the major places to host Olympic/Paralympic games in 2020. Volleyballs, Tennis and Triathlon games will take place here. We expect that all people, Japanese and international visitors, will enjoy the 2020 events. We also hope we can impress everyone with our future ODAIBA!! :) Odaiba needs to continually develop. But how can we develop the town? Creating technology is one of the ways to address the question. This is what we set up as the mission for this workshop. A variety of people from all over the world gathered in the workshop. Each of them has totally different background. They split into several teams to fulfill this mission. Each team created unique technologies like in this picture. What they are holding shows the technology they invented. Various ideas ranging from a realistic app to very futuristic one were created. I classified them into 3 categories, App, Device and Dreamy Technology. Let's take a look at one by one together!! Nowadays, mobile apps are essential. In fact, apps promote efficiency, productivity and joy in our life. Many types of apps will continue to change our life as ever unless app developer stops creating new apps. Development of apps can be achieved most quickly among the three categories. There are many places to enjoy night-life in Odaiba. The app enables us to play several places all-night only for ￥5000. Most tourists want as many experiences as possible, so this would be a nice tool. It's an app for finding an available bicycle. There are available bicycles called Community Cycle in Odaiba. This App helps us find available bicycles and parking spaces on the map. With this app, we can move around Odaiba easily. This section shows futuristic devices that could be also feasible by 2020. Generally, development of new devices takes much more time than that of App, but newly designed devices will have an impact on our life by the 2020 event. This tech helps you with language. You rent a wristwatch with AR tech from a vending machine at the station. The wristwatch shows you an animation character and when you speak to it, it translates your words into any language. This technology makes it possible for you to communicate with all people no matter what language they speak. It's a new type technology on a bus stop sign. Most of signs are written in Japanese or English but not in other languages. This bus stop shows bus info, detailed map, weather and etc. in several languages with touch screen. The technologies shown above are feasible to some extent by 2020. The next three teams invented very futuristic ideas. Frankly speaking, these ideas seem to be difficult to achieve by 2020. But imagination holds enormous potentialities to encourage development in the long run. Their ideas are also impotant. It's a flying train that flies over Tokyo bay and buildings. With this train, we arrive at the destination much faster. The track is made of carbon nano tube, a material that has excellent strength and electrical property. It also provides us with great views! It's a personal gondola to move around Odaiba. There are limited kinds of transportation in Odaiba, so it can provide us with comfortable private space for transportation and sightseeing. Underground developing technology makes land more comfortable and allows people to enjoy various activities. Many visitors gather in Odaiba for events and the streets can be very crowded. For the Olympics, many more people will come and enjoy activities, so this could solve the problem of space. What do you think of these technologies? Will these be possible by 2020? As you see, many ideas came from the workshop. 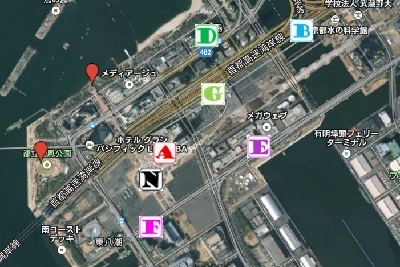 We not only created, but we also applied these technologies into an actual map of Odaiba, like this. In 2020, these technologies could actually be used. At least, I can imagine that many visitors comfortably enjoy around Odaiba with these technologies. 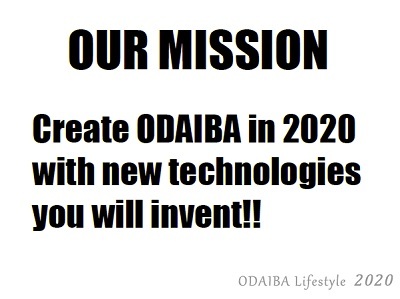 Overall, many people got involved in creating new technologies to make Odaiba better. This is almost the same process as in actual town planning. Not only town planners but also artists, scientists, athletes, cooks, etc. collaborate together for planning. This workshop demonstrates just one example just taking up Odaiba planning. Any of us, no matter where we are, can take part in the town planning someday. Your experience and knowledge would be important to develop your town. Please freely share your ideas. Even though you are not involved in planning directly, your ideas from your life-experiences will help the town build and progress. Everybody is a town planner! Have a good life in your town!